Breathtaking Alpine vistas await as you travel through Italy, Switzerland, Austria and Germany. From amazing railways to the thrilling Passion Play, experience the wonders only found in the heart of Europe. Arrive in Stresa (Lago Maggiore) and take some free time to explore this beautiful lakeside town on your own. Your evening begins with a cocktail party in a wine shop before we cruise to our welcome dinner on Isola dei Pescatori, the most beautiful of the Borromean Islands. We can arrange a transfer from Milan Airport to Stresa for $60.00 per person. Today we make our way to an ancient village nestled in the mountains. Stop at a family farm to learn about the artisan cheeses they produce. Sample delicious creations and discover how to pair them with local wines. Return to Stresa for an afternoon at leisure. Depart Lago Maggiore for a scenic drive into the heart of the mountains. 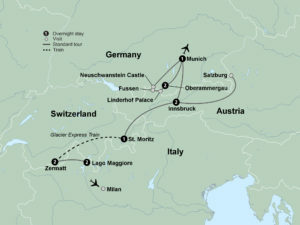 The incredible views of the Italian and Swiss Alps are sure to leave a lasting impression. Upon arrival in Tasch, board a local train for a ride to the spectacular pedestrian village of Zermatt in the Swiss Alps. Today, Zermatt is at your fingertips. It’s your choice! Tour Zermatt’s best- known landmarks by foot with a local expert; or, enjoy a visit to the Matterhorn Museum where you’ll learn more about the triumph and tragedy behind the first ascent of this imposing peak. The remainder of your day is at leisure. Traverse bridges and tunnels while aboard the world-renowned narrow gauge Glacier Express, the most charming express train in the world. Enjoy the natural beauty of this route through the heart of the Swiss Alps. Filled with forests, fragrant meadows, streams and deep valleys, it’s a mountain dream come to life. Arrive in St. Moritz, playground of the rich and famous. Drive through the picturesque Engadine Valley to Innsbruck, Austria, capital of the Austrian Tyrol. Join a local expert and explore the city’s medieval pedestrian streets including Maria Theresian Strasse, the Hofburg and the Golden Roof. Travel the Austrian countryside to historic Salzburg, one of Europe's most beautiful and romantic spots. Enjoy a leisurely walking tour of Salzburg’s historic Old Town - the Altstadt. See highlights such as the Cathedral, Mozart's birthplace and Mirabell Gardens. Film buffs will be able to pick out locations from The Sound of Music. This evening, enjoy a delightful Mozart dinner concert at the centuries-old St. Peter’s Restaurant, central Europe’s oldest restaurant. Today we head to the frontier of Germany, crossing the border into Bavaria. Arrive in the Bavarian capital of Munich for a walking tour featuring the Marienplatz, the Glockenspiel and Olympic Park. Next, depart for the quaint village of Oberammergau, nestled in the Bavarian Alps. This afternoon, witness a performance of the epic Passion Play. The original performance dates back to 1634. During the Thirty Year War, Oberammergau was spared the Black Plague and for this reason, the citizens vowed that every ten years they would give a play to honour the last days of the life of Christ. The performers of this once-in-a-decade event are all native to the village. To lend authenticity to the performance, the cast start to grow their hair and beards more than a year in advance. Also, the intricate costumes are made locally by the villagers. During a break in the performance, join your fellow travellers for dinner before returning for the remainder of your Passion Play performance. Travel to nearby Linderhof Palace, one of the most artistic and stylistically complex ensembles of the 19th century. It is the only palace King Ludwig II of Bavaria was able to complete. Behind the Baroque façade is a Rococo world, rich in abundant ornamentation. Next, enjoy free time exploring medieval Füssen, the romantic town in the foothills of the Bavarian Alps. Make a special picture stop at Neuschwanstein Castle, Germany’s most famous castle and the inspiration for the castle in Sleeping Beauty. This evening, gather with your fellow travellers for a farewell dinner celebrating the end of an unforgettable journey. We can arrange a transfer from your hotel to Munich Airport $60.00 per person. Spend two nights in lovely Stresa, located on the banks of picturesque Lago Maggiore. Experience the most legendary of Alpine railway journeys: the Glacier Express. Explore Salzburg’s historic and charming Old Town – the Altstadt. Relish Italian cuisine on Isola del Pescatori in Italy’s Lago Maggiore. Enjoy a wine and cheese pairing at an Italian family farm. Delight in dinner and a Mozart concert at the 1,200-year-old St. Peter’s Restaurant, central Europe’s oldest. Space on this tour is strictly limited to 16 places so please book in as soon as you can. Our allocation will be revoked on 21 June 2019. Please complete a Travel Booking Form and pay a $1,000 deposit. Please complete the credit card field on the booking form if you want us to charge your card. For Oberammergau you can only purchase comprehensive travel insurance 2 years in advance if you are under the age of 70 years. Prices are based on a twin shared room containing two single beds or 1 queen bed. 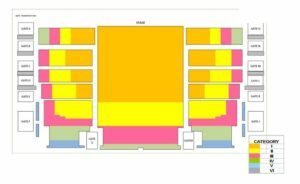 Seating for the performance will be in Category 1 (dark yellow in seat map).